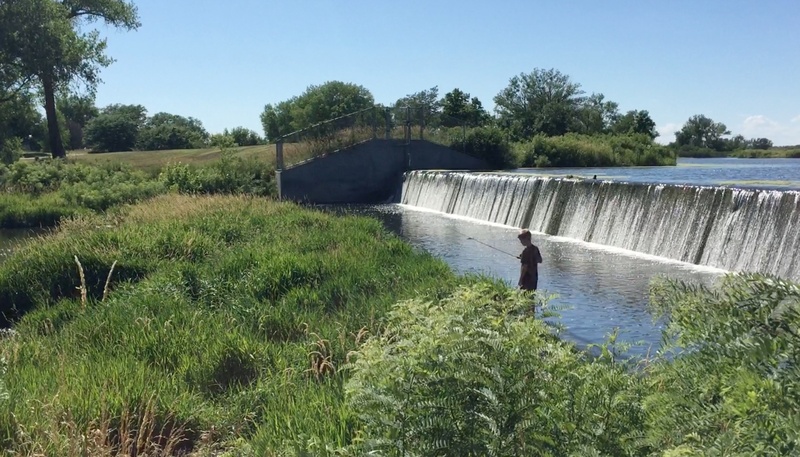 A few days ago, while Mark was setting up camp in a city park in Atkinson, Nebraska, I noticed a young boy alone, barefoot and fishing at the foot of a small dam. I looked around for a parent or sibling, but clearly he was alone and his sole focus was catching some fish. I really enjoyed watching him casting the rod, all alone there in the park, and thinking about how small town life is still alive and well in America in some places. 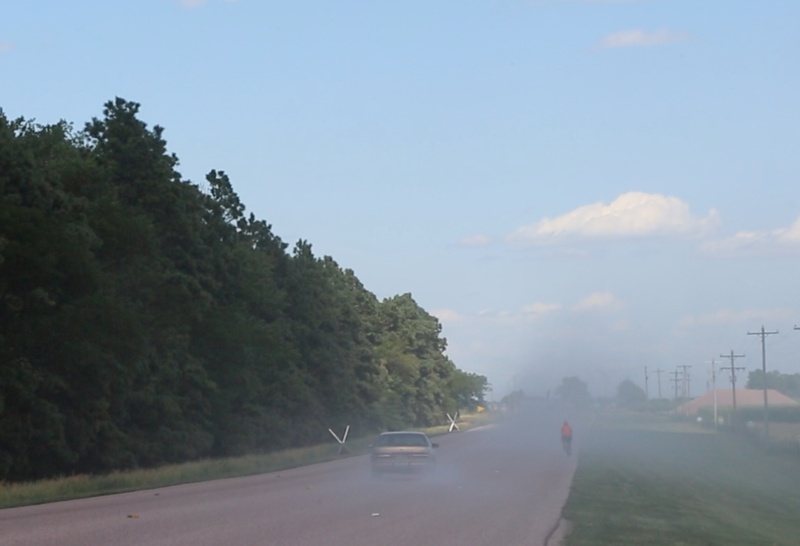 A short time later, an older boy in basketball shorts and a Nebraska t-shirt pulled up on an ATV and started shouting something to him. It sounded like “we have to go” but I wasn’t sure. He was tall, wearing basketball shorts but he had a slight accent and it wasn’t from Nebraska. The younger boy showed his fish to the older boy and asked how to take the hook out of the fish because it was the kind that stings. This went on for a few minutes and as the younger boy began collecting his buckets and fishing rod, I asked the older boy where he was from. The accent was something familiar but I couldn’t place it. He told me that he was from Bulgaria and he was just adopted 3 months ago! I quickly mustered up the Bulgarian that I remembered from living there the past 4 years while we were teaching at AUBG (American University in Bulgaria), and he was certainly surprised to hear familiar words coming from a lady he had just met in a city park in Atkinson, Nebraska. We talked about his life in the U.S., which he said was a better life than back home. But still he misses Bulgaria, specifically some food (lutenitsa, banichka) but has learned to love tacos. I brought both boys, 14-year-old Rumen and his new brother, Andrew, over to meet Mark. 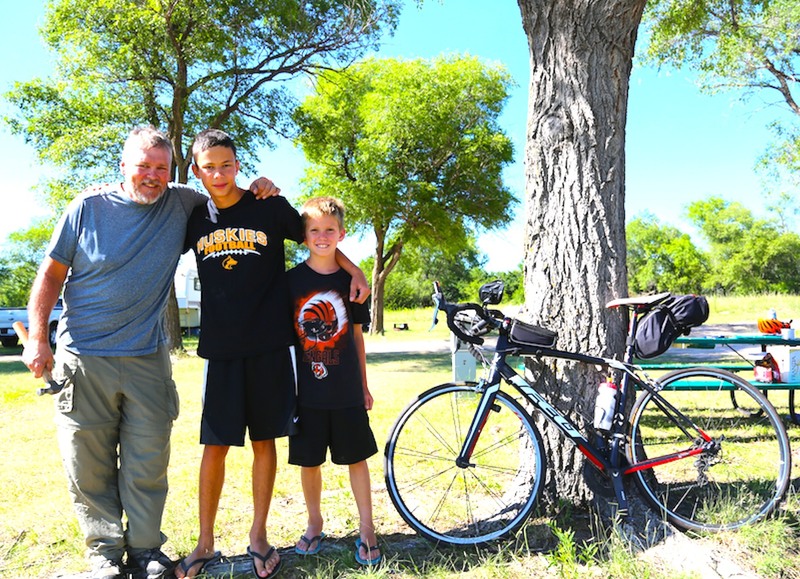 They were interested in Mark’s bike and the fact that he was riding all the way across the U.S. We talked about Bulgaria (he was from Veliko Tarnovo) and he had also visited Blagoevgrad several times (where we lived – he had been to the water park there). I snapped a few photos of Mark with the boys but then I remembered I could not use their pic on the website without permission from one of the parents. Could they please go home and explain to their parents that this lady and her husband were camping in the city park and used to live in Bulgaria and would like to get their permission to use a photo of them on her website? I doubted they would come back. About 10 minutes later, their mom drove up with the most of the family (2 lovely girls + Andrew and another younger boy) to introduce herself. Misty explained how she and her husband Jared had adopted a special needs boy from Bulgaria 2 years ago. They went back this past November and, after mountains of paperwork and taking turns living in Bulgaria for 2 months, they finally got Rumen. Misty and I talked about Bulgaria for a long time and all the challenges she has faced. 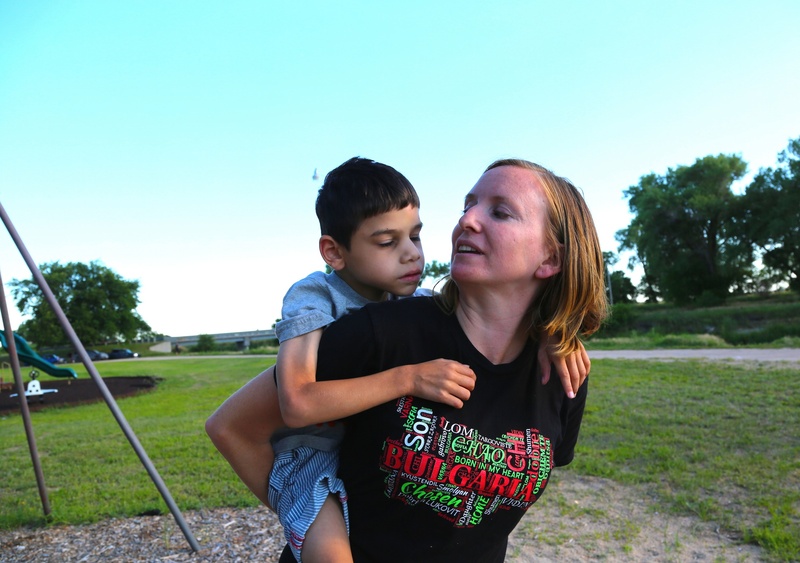 When she got her younger son, the workers at the orphanage told her that he would never walk. Today, he is walking. They also said he could not communicate. Today, Nathaniel is using sign language and and Misty can understand what he wants for dinner. Misty did not – could not – give up on him. She has different challenges with Rumen, who wasn’t sure he wanted to leave his friends from the S.O.S. village but once the paperwork cleared he agreed to leave with Misty. Teenagers are teenagers anyway and on their way to becoming independent. Rumen did not have much supervision back in Bulgaria and is not used to being part of a family. He is learning how to adapt. So is she. So are they. It’s all very complicated. I admire Misty and Jared for adopting two Bulgarian orphans and giving them a better life. 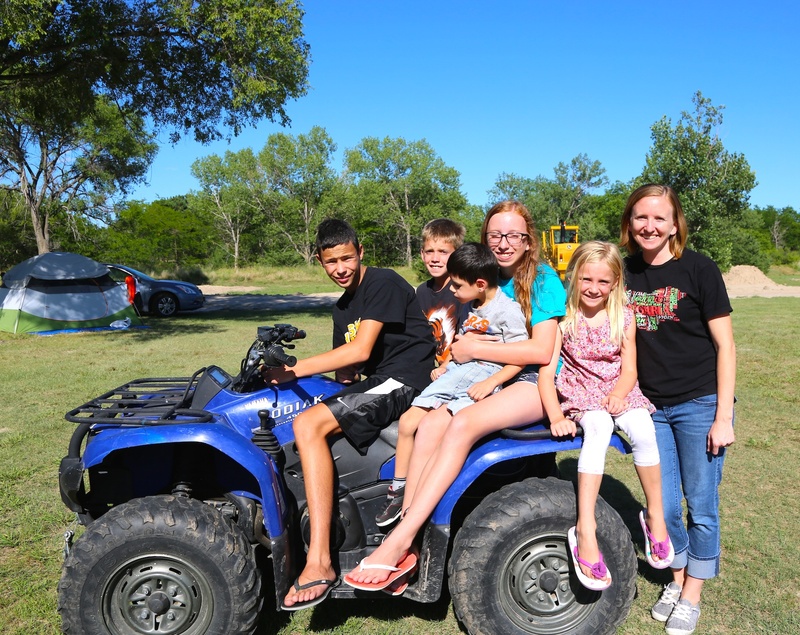 Their other children have learned about tolerance, acceptance and caring, which is not easy to do in a small town when you are the only family with kids adopted from another country. Years ago, I considered adopting a child from Romania. I had been to Bucharest to teach a journalism workshop and went to an orphanage as part of the class and fell in love with a little boy there. I didn’t do it. We weren’t brave enough. Misty and Jared have done it. It’s pure love. And I found it while camping in a city park in Nebraska.